You are at:Home»Arts & Entertainment»Music»November 28, 1925: What is The Grand Ole Opry? November 28, 1925: What is The Grand Ole Opry? On November 28, 1925, a one hour “barn dance” radio show began in Nashville, Tennessee broadcast on WSM that became known as The Grand Ole Opry. The show is the longest running radio show in history, although it has changed networks over the years. A most American of radio shows, the Opry features country, western, folk, bluegrass, Gospel and Americana music forms, as well as comedy skits and other entertainment. 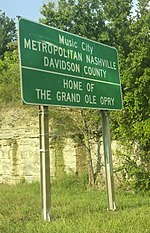 Signs welcoming motorists to Nashville on all major roadways include the phrase “Home Of The Grand Ole Opry”. The increasing success of the GOO forced a move into a larger theater from which to broadcast the (live) show, and then another and another larger theater. After more upgrades, in 1972 Opryland USA complex with a theme park and hotel was opened, with the newest theater, The Opry House, opening in 1974. The premier of the Opry House was a big event, with none other than President Richard Nixon attending and playing the piano at the inaugural show! In the year 2000 the Opry Mills was added to the Opry complex. In 2015 the Opry House was made a National Historic Place. Today the Grand Ole Opry is broadcast on WSM (AM radio) at 7 pm on Saturday nights. It is also featured on Sirius XM satellite radio (channel 59). Other versions of the show are broadcast on other nights, and syndication has taken the program to radio stations all over the country. Being made a member of the Grand Ole Opry is an honor for performers and people in the music business, and has been compared to induction into a hall of fame. Special shows are sometimes held for Christmas or other events, television specials are occasionally aired, and regular television shows have been spawned from the GOO. The Grand Ole Opry claims to have brought country music to all of America and to have pretty much made country music what it is today. I was unable to determine the daily audience numbers for Grand Ole Opry shows, but it must certainly be in the millions. The Grand Ole Opry is an American institution and we congratulate them on 92 years of entertaining the USA. Here’s wishing you another 92 years or more! Question for students: Why has The Grand Ole Opry endured for so long? Oermann, Robert K. Behind the Grand Ole Opry Curtain: Tales of Romance and Tragedy. Center Street, 2008. Next Article November 29, 1963: What Was the Warren Commission?